Former Glencore CEO Clinton Ephron has confirmed that former Minerals Resources Minister Mosebenzi Zwane was in Zurich, Switzerland, to negotiate for a R2.5 billion sale of Optimum to the Guptas. However, Zwane had denied this in Parliament. Coal Supply Agreement deal between Eskom and Glencore Optimum mine. Tony Gupta is reported to have met with Ephron in Switzerland the next day to negotiate a deal for Optimum mine despite Glencore having taken it off business rescue. Ephron says Zwane told him and other Glencore employees that were present in the second meeting that Optimum mine should remain open as it was important in creating jobs. 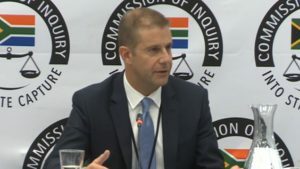 The post Ephron says Zwane met with Guptas regarding sale of Glencore appeared first on SABC News – Breaking news, special reports, world, business, sport coverage of all South African current events. Africa's news leader..